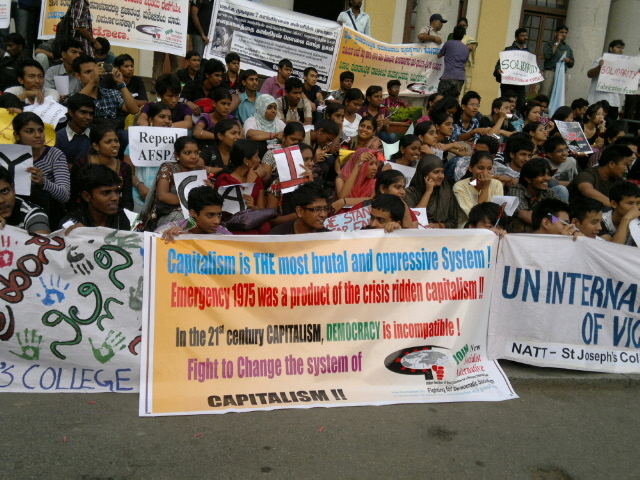 About 500 people, including many students, activists and a few workers joined the protest – Resist the Silent Emergency, organized by many groups and organizations including the New Socialist Alternative (CWI-India) on 26th June to mark the 37th year of declaration of emergency in 1975. The protest mainly highlighted the emergency like situation prevailing in many parts of India even today after almost 65 years of independence. Also highlighted were the false cases that have been foisted against many radical political and human rights activists such as Abhay Sahoo (leader of the anti-POSCO resistance moment), Irom Sharmila (who is in her 12th year of fast in Manipur), S P Udayakumar (from the anti-Koodankulam struggle), more recently Seema Azad and her husband (from PUCL) and many countless others who are languishing in jails across India. Jagadish G Chandra (New Socialist Alternative CWI-India) spoke of the innumerable instances of deliberate targeting of activists by the Indian state under draconian laws such as AFSPA, UAPA etc., as well as the role of multinationals corporations in trying to grab land and resources for profit. Others who spoke included Manohar (SICHREM), Roy David (Coorg Organization for Rural Development, Kudoor Mutappa – an Adivasi activists from Coorg and quite a number of students also spoke. Protest songs were sung by Adivasi activists from Coorg and skits/ plays were staged by students from St. Joseph’s. About thousand leaflets were distributed during the protest. New Socialist Alternative (CWI-India) also brought out its banners during the protest. Quite a few workers, attending a CITU trade union (affiliated to the CPI-M) convention at Town Hall (protest point), also attended the protest. Rights of Indian People in Danger! Defend Democratic Rights! !